Show off memories with this HP Sprocket photo printer. Print pictures from your smartphone by choosing them from the camera roll or a social media website. A rechargeable battery lets you print up to 30 pictures per charge and recharges in only 60 to 80 minutes so you can print on the go with this HP Sprocket photo printer. About the size of a smartphone, this Bluetooth printer goes anywhere. It easily fits into a bag or backpack, and it's so light you’ll barely notice it's there. Enter your printer's model number into our Ink and Toner Finder to find compatible cartridges. Open the top of the printer, drop the paper in, and start printing. 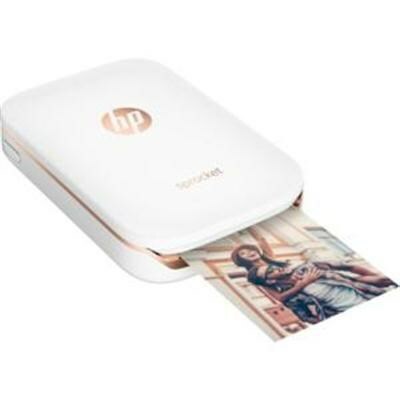 Get started right away - the HP Sprocket Photo Printer comes with a 10-sheet pack of photo paper. Easily print social media photos. Connect your social media accounts to the HP Sprocket App and instantly turn any of those photos into colorful prints. You can easily customize your photo before you print. Tap the Edit button to add a filter, frame, stickers, text, emojis, or to crop your image.